Many structures suffer from unwanted vibrations and, although careful analysis at the design stage can minimise these, the vibration levels of many structures are excessive. In this book the entire range of methods of control, both by damping and by excitation, is described in a single volume. Clear and concise descriptions are given of the techniques for mathematically modelling real structures so that the equations which describe the motion of such structures can be derived. This approach leads to a comprehensive discussion of the analysis of typical models of vibrating structures excited by a range of periodic and random inputs. Careful consideration is also given to the sources of excitation, both internal and external, and the effects of isolation and transmissability. A major part of the book is devoted to damping of structures and many sources of damping are considered, as are the ways of changing damping using both active and passive methods. The numerous worked examples liberally distributed throughout the text, amplify and clarify the theoretical analysis presented. Particular attention is paid to the meaning and interpretation of results, further enhancing the scope and applications of analysis. Over 80 problems are included with answers and worked solutions to most. 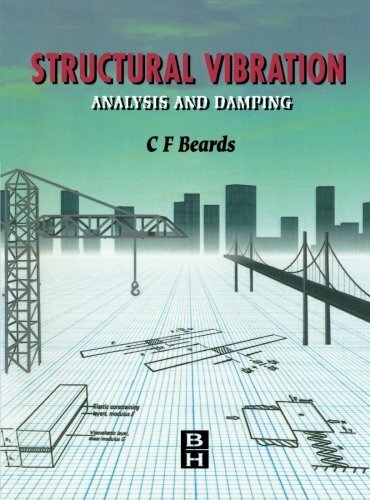 This book provides engineering students, designers and professional engineers with a detailed insight into the principles involved in the analysis and damping of structural vibration while presenting a sound theoretical basis for further study.